Jessie Hussey’s contribution to the knowledge of SA’s marine flora | Marine Life Society of South Australia Inc. According to the web page found at http://know.ourplants.org/news/jessey-hussey-inspires-school-teachers/ Jessie Hussey made a “significant and pioneering contribution to the knowledge of South Australia’s terrestrial and marine flora during the 1890s. She became a respected collaborator of many leading national and international botanists and phycologists”. According to the web page found at http://www.cpbr.gov.au/biography/hussey-jessie.html , Jessie Hussey was recruited by Baron Ferdinand von Mueller in 1893 to collect marine algae specimens in the Encounter Bay area. She sent large numbers of algae (and plants to both Mueller and Swedish botanist Jacob Agardh. When she died in 1899, about 2000 of her specimens were deposited in the South Australian Museum. Jessie Hussey was born at Port Elliot on 5th June 1862. She was one of Henry & Harriet Hussey’s nine children. They lived at Goolwa in the early 1850s until the family moved to Port Elliot in 1880. Jessie collected many algal specimens and Jacob Agardh identified these for Ferdinand von Mueller. Both men named some of her specimens after her. According to the web page found at http://www.cpbr.gov.au/biography/mueller-ferdinand.html , Ferdinand von Mueller was Victorian Government Botanist from 1853 and his botanical publications are very extensive. He was knighted by Queen Victoria. According to the web page found at http://www.cpbr.gov.au/biography/agardh-jacob-georg.html , Jacob Georg Agardh was a botanist, phycologist and taxonomist. From 1854 until 1879 he was professor of botany at Lund University. He identified many algal specimens for Ferdinand Mueller and his collectors. According to “Curiosities of South Australia 3” (mlssa No.1078), Jessie gave an address to the Field Naturalists’ Section of the Royal Society of SA when she was 35 years old. She was a member of the Field Nats and she was totally deaf at the time. She had apparently been deaf for some years. She was an honorary member of the Mueller Botanic Society, WA. She died in Port Elliot at the age of 37 on 16th March 1899, after becoming ill following the deaths of both Ferdinand von Mueller (Oct 1896) and her father Henry (Jan 1899). How many alga can you name to scientific level? There are just over 80 images in Marine Plants section (3000 series) of our Photo Index. Several of those are either of the same species or of unknown species. It would be great if we were able to match the efforts of Jessie Hussey and build those numbers up to something like 2000 images. Species of alga apparently named for or after Ferdinand von Mueller include Heterosiphonia muelleri and Dictyopteris muelleri. Scaberia agardhii appears to be named after Jacob Agardh. This is our Photo Index image of Scaberia agardhii (no.3031). It also features many other alga in the frame. It was taken by Society member David Muirhead. Check out the numerous algal species featured in Paul Day’s video footage from Point Riley at https://www.youtube.com/watch?v=wCY_2FY9A74&list=PLcPiwIlhaojQi7RN2QDIZoUqZ96murU0Q . Our Photo Index of South Australian Marine Life (incl. 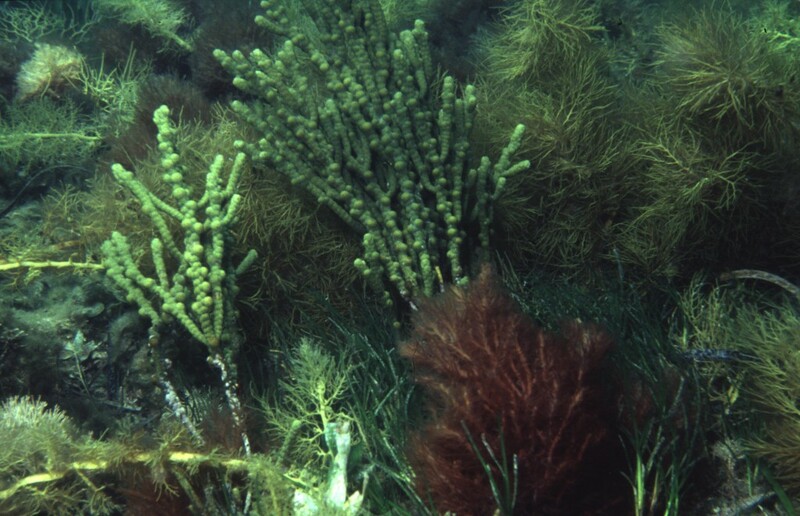 marine plants) can be found at http://www.mlssa.asn.au/index.html . We have a good reference book called “Marine Plants of Australia” by John M. Huisman (mlssa No.1058) in our Society’s library. Many slides of images in our Photo Index are available. http://www.mlssa.asn.au/index.html is part of our old website. http://www.mlssa.org.au is our current site.